I loved DEADPOOL - the dark humour, the self-awareness, the bloody violence, and the surprisingly mushy love story at its heart. And I can happily say that DEADPOOL 2 lives up to the promise of the first film, while giving the protagonist a motley crew of superhero buddies and poking even more fun at superhero films, its own actors, and everything else. The movie opens with our cynical wise-cracking mutant hero murdering bad guys for pay before going home to his beloved wife who is murdered in turn. 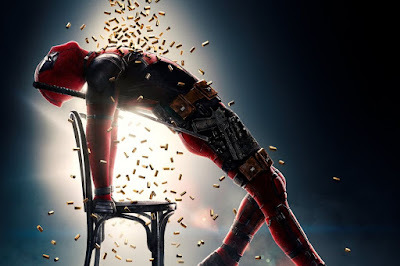 Being worthy of meeting her in heaven motivates the otherwise self-interested Deadpool to try to save an angry young mutant called Firefist (Julian Dennison who could easily be Rebel Wilson's kid brother such are his looks and facility for comedy). Deadpool has to do this in opposition to time-travelling tough guy Cable (a ridiculously ripped Josh Brolin), who just wants to kill Firefist to prevent him wreaking havoc in future. Along the way, Deadpool picks up a new super-lucky mutant friend called Domino - a charismatic scene stealing performance from ATLANTA's Zazie Beetz - while hooking up with Colossus and Negasonic Teenage Warhead from the first film, as well as her girlfriend Yukio. What I love about this film is that while it has a filthy sense of humour it really does have a heart. It really is about family and reaching out to people. And it's values are rock solid. Not just in the classic mutant universe as a metaphor for civil rights way. But in making a point about having a protagonist who is plus sized, a teenage lesbian relationship, and a strong black female lead. The film is also clever. The way in which it uses time travel is neat, and all of its jokes hit their mark, getting particularly meta in the credits sequence, and with a fantastic use of music. Having tired of the Marvel and Star Wars franchises, I can honestly say I'm genuinely looking forward to DEADPOOL 3! DEADPOOL has a running time of 119 minutes and is rated R. It is global release.